Free shipping. Buy direct from HP. See customer reviews and comparisons for the Belkin Home/office 6 Outlet Surge Suppressor. Upgrades and savings on select products. 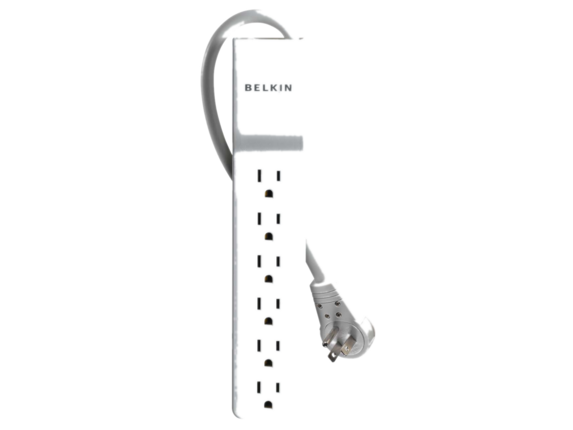 This Belkin Home/Office Series Surge Protector provides premium power protection for small home appliances, and other connected devices. Our decades of research and development have led us to the release of this breakthrough series. We've used advanced design elements, top-quality construction, and superior circuitry and components to provide the most complete protection from power surges, spikes, and AC contamination available. Belkin backs this model with industry-best Lifetime Product and Connected Equipment Warranties. This Home/Office Series model protects everyday household electronics. Its slim, sleek design blends seamlessly with today's modern electronics and appliances.